Summer season in Australia, especially in warmer areas such as Perth, is something that is not always looked forward to. Many will agree to this feeling. When you are stuck at home on a hot day the only way to cool down is by the pool, beach or go to the shops. Due to this, air conditioners have become a popular home appliance in summer. However, do you know what type of air conditioner for your house? What size is ideal? The size of the air conditioner to be installed in your room depends on the size of the room that needs cooling. Generally, in Australia you will need 120 to 150 Watt of power per square meter of floor area. Your floor area is your width x length of the room to be cooled. A simple calculator formula can be used to work it out by multiplying your floor size by the appropriate wattage. This wattage depends on your house features. If you are not sure what size you need, check out the factors in the next section to help you decide. Here is a chart to help calculate the air conditioner size you may need based on your floor space. The above chart is based on a regular size home and is only indicative. It may not apply to your current floor space. Nevertheless, this is a good guide size for a split air conditioner. For example: A 3.5 kw air conditioner will cool a room size from 21 m2 to 35 m2 efficiently. If you are looking for a ducted air conditioner size guide you need to work out how many rooms you will have on at the same time. Then work out the size of those rooms and add them together. This will give you a general idea of what sized unit you need. In most cases you should contact a specialist to quote for you. How hot is your climate? These factors matter when choosing the right sized AC unit for your room. To allow us to have a room size guide we will say a very efficient room has great insulation, light coloured roof tiles, double glazed tinted windows which don’t face the sun. The worst case is basically the opposite. What Are the Types of Air Conditioners Available? Most households in Australia utilise one of two types of air conditioning, A ducted or split system air conditioner. This type provides discreet comfort. It is commonly installed on large areas such as shopping centers and workplace. But recently, there is an increase in installation for homes. 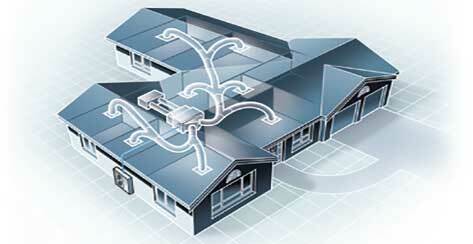 It has a central source of cool air where fans send cool air to each duct system and into each room. This air conditioner that is ideal to keep an even temperature for a larger home. Ducted systems use to be quite pricey on electricity. However, now because of the common use of zones you can cool certain rooms at a time while leaving other unused rooms warm. Zones are basically doors that block off the flow of air in ducts to the desired rooms. This allows the unit to use less power because it is cooling a smaller area. This type has an indoor wall mounted and an outdoor unit. The outdoor part is installed on an external wall of the room that needs to be cooled. If the internal unit is to be mounted on an internal wall you will need a pump to be installed to pump the condensate out of the house. This is generally not recommended as pump commonly block up and fail. This type of air conditioning is ideal when you are maintaining a single indoor room or an open area. However, if you need multiple rooms throughout the house cooled, it may be more cost effective & aesthetically appealing to go for a ducted unit. It is essential for you to choose the right air conditioner size for your room. If you select the appropriate size, it results to increase the efficiency of the appliance. A correct size of air conditioning system installed in your room helps cool down the room temperature slowly but efficiently. However, if you choose a big unit, it quickly cools the rooms air but not the furniture, walls and ceiling and then shuts off. The room quickly warms up and the air conditioner goes in a cycle of shutting off and on. This increases the cost of your utility bill. If it’s too small, the room won’t be cooled to the desired temperature. This causes the air conditioner to constantly be running at its full power and thus reduces the lifespan of the unit. In addition, some units are less energy efficient at their maximum power compared to a higher-powered unit running at the same level. So, the advice most specialists give is: if in doubt, go bigger. Why? In more recent times air cons sold are usually modern inverter units which can reduce power output quite efficiently for a smaller sized room than intended for.